Habitat : Native to europe and north africa and also grows in asia. 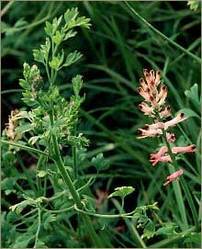 Uses : Fumitory has been used as a treatment for arthritis, liver disorders and gallstones and acts as a diuretic, slightly diaphoretic, a laxative, aperient, a tonic, a digestive and as an infusion used externally in the treatment of scabies and eczema. It is particularly valuable in the treatment of all visceral obstructions, particularly those of the liver, in scorbutic affections and in troublesome eruptive diseases of the skin. A decoction makes a curative lotion for milk-crust on the scalp of an infant. A yellow dye is obtained from the flowers. A decoction makes a curative lotion for 'milk-crust' on the scalps of babies. It is also used in cold, fever, certain skin disorder. Used in cosmetics as facial tonic because of its emollient properties. Also known for its blood purifying property.